10 LISTS Adventure TimeLists about the 2010 animated series that follows a boy named Jake, his magical dog Finn, and their friends and neighbors in the colorful post-apocalyptic Land of Ooo. 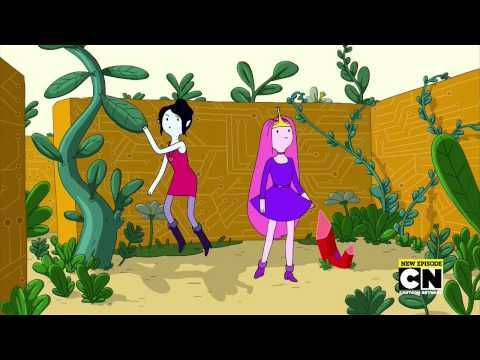 There are plenty of great Adventure Time fan theories, but few are more titillating than the supposed lesbian relationship between Princess Bonnibel Bubblegum and Marceline Abadeer the Vampire Queen. They could very easily join the list of gay cartoon stars, according to some fans, and it wouldn't be much of a surprise if they did. Princess Bubblegum and Marceline's relationship, also referred to as Bubbline, has a lot of evidence suggesting that is so much more than a mere platonic bond. And while there is no shortage of Adventure Time LGBTQ subtext, there are times when it seems downright obvious that the two are gay. It would be more than refreshing if they were able to acknowledge their love unequivocally, once and for all. At this point, Bubbline is basically canon. In an interview with fans, the voice of Marceline, Olivia Olsen, recounted a conversation she had with Adventure Time creator Pendleton Ward. Olsen says that the creator asked her, "You know they dated, right?" Unfortunately, it is illegal to mention a romantic relationship between women in some of the countries where the show airs, so any overt reference to the relationship would negatively affect the show, allegedly. Rather than lose viewers, the show keeps the relationship covert. With the show nearing its end, however, the possibility remains that Marceline and Princess Bubblegum's relationship will soon go public. In the episode "What Was Missing," it is revealed that Princess Bubblegum's great treasure is actually a band t-shirt that Marceline gave her. In the episode "Sky Witch," it's apparent that Bubblegum's attachment to the clothing item is deeper than we might have expected. 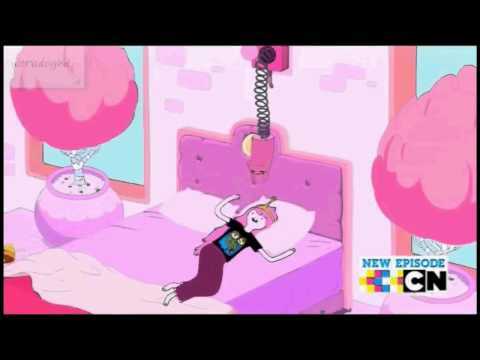 It's similar to Finn's obsession with his lock of Bubblegum's hair. Apparently, Bubblegum passionately sniffs the tee in the morning when she wakes up. Members of a platonic relationship don't usually breathe in each other's scent to start the day. In episode "What Was Missing," Marceline sings Princess Bubblegum a song filled with what can only be described as romantic tension. This is the first real glimpse into the Bubbline relationship that audiences get. From the ballad, the viewers can glean that the two used to be very close but had a falling out which still bothers Marceline. The Vampire Queen wants to make amends but doesn't think that her paramour feels the same way. Then it all gets too real for Marceline and she blushes in embarrassment. It's like the ultimate drama bomb. In episode "Broke His Crown," Marceline and Princess Bubblegum go on an adventure together to explore the inner workings of the Ice King's crown. Throughout the episode there are several awkward moments between the two, all alluding to a previous (or current) romantic relationship. In addition to Marceline commenting that the princess knows how to "push [her] buttons," PB grins knowingly when Marceline is asked about her love life. 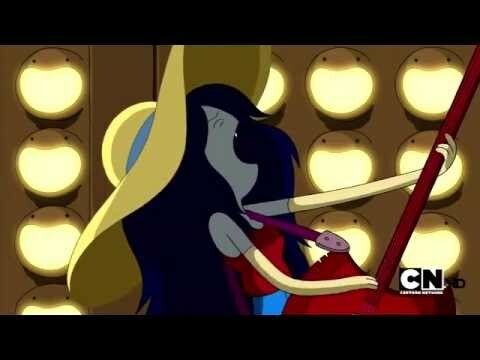 Marceline even blushes and dodges the question. The whole episode is reminiscent of someone introducing their significant other to their parents. It's like Marceline is bringing Bubblegum over for dinner with her foster father, the Ice King. They are even dressed for the occasion.